In a season filled to the brim with injuries seeing Kenta Maeda crumble on the field after being struck on his right knee was distressing. My immediate thought was, "what else could go wrong?" "He's feeling better actually now," Roberts said. "It was something with a nerve that just lit him up." 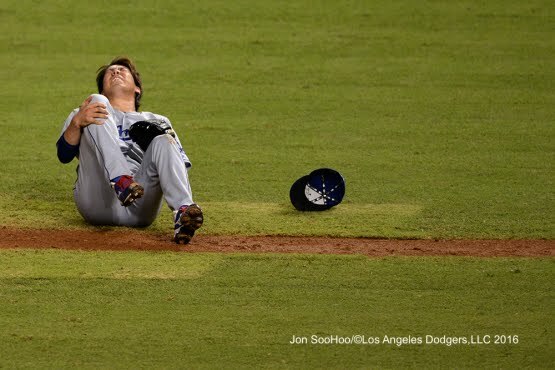 "What I know for sure is that it didn't hit the bone," Maeda said through a translator. "But I wasn't able to put any strength or flex it at all, so I was a little bit in shock." "It's hard to tell at this point, but I will reevaluate [Wednesday]," Maeda said through his interpreter. "My hope is to make the next scheduled start. What I know for sure is it didn't hit the bone, but I wasn't able to put any strength or weight on it and I was kind of shocked. Among all the hits taken in the past, it hurt the most. " I don't know if this team could have survived another major injury to its starting rotation. So I think it's fair to say we dodged a bullet. BTW, the Dodgers were victorious over the Diamondbacks, 7-4. They slugged four home runs; including a pair by Joc Pederson. This Day in Dodgers History: In 1938 Johnny Vander Meer pitched his second consecutive no-hitter, beating the Dodgers at Ebbets Field. He had no-hit the Braves four days prior. In 1951 Buzzy Bavasi made his first trade as the Dodgers GM. He received Andy Pfako, Johnny Schmitz, Wayne Terwilliger, and Rube Walker in exchange for Bruce Edwards, Joe Hatten, Eddie Miksis, and Gene Hermanski. In 1996 the Dodgers turned their first triple play in 47 years. It was against the Braves in the first inning. Happy Birthday, Brett Butler and Dusty Baker! Via Ken Gurnick at MLB.com; "Puig expected to rejoin Dodgers on Monday." Puig has been on the 15-day disabled list since June 3 with a strained left hamstring. In his first game, Puig homered and walked in three plate appearances. "I saw the video, he came out of it healthy and the homer was a really good swing," Roberts said Tuesday before a 7-4 win over the D-backs. "It was a line drive to right-center and the mechanics looked better than when he was here. The challenge is for him to sustain that, but it was positive." Via Harold Uhlman at Think Blue LA; "Nine Drillers named to Texas League All-Star team." 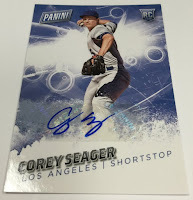 With Father's Day around the corner Panini has released more preview pics from the in-store Father's Day promotion; including the signed Corey Seager card on the right. Go here to see more preview photos. Gary Lee at Dodgers Nation shares an interview with one of the moderators at the r/Dodgers Reddit page. Check it out here. Via Sam Miller at Baseball Prospectus; "Pebble Hunting: Clayton Kershaw's 'Mistakes', Chapter Two." Which raises the possibility that Kershaw is something akin to Stephen Curry, whose success rate on three-point shots, against all logic, doesn’t seem to go down when he takes more (and, consequently, harder) three-point shots. Kershaw’s success rate on Zone 12 pitches doesn’t seem to go down when he threw more (and, consequently, more dangerous) Zone 12 pitches. It’s conceivable that Kershaw could get away with throwing every single galdarn pitch down the middle. Hold me?